Boston Marathon 2019. My race recap. Some personal information here but if you’re a female runner and/or coach working with female runners, it’s probably nothing you haven’t heard before or are not familiar with. The week before Boston, I was so excited but I also had so much nervous energy. I was working up until the day before we left and I had some new projects to work on. I was supposed to start my period Monday, a week before the marathon and for some reason I didn’t start until Friday (3 days) before the marathon. Before that I wasn’t sure what was wrong? Was I pregnant ? Too stressed? Not sleeping enough? Not eating enough…..Ha! I was pretty sure I was fueling well. Overall, I was just so excited to get to Boston and see my husband (he was out of town for work and had to meet us in Boston), family and friends. Race week I ate foods I like to eat often and regularly (nothing new) spaghetti, tacos (homemade and from Homestate-delicious), rice and salmon, oatmeal, banana, peanut butter and honey or peanut butter and jelly sandwiches, fruit, not too many salads the days before the race. I was feeling good! I packed many snacks for the plane (banana, almond and peanut butter, trail mix, graham crackers, apples, sandwich, cuties and cheese). 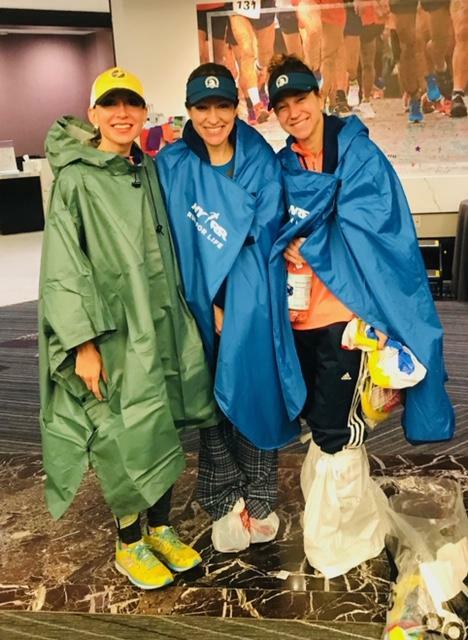 When we finally arrived in Boston late Friday evening, I finally relaxed, started my period and decided this race was going to be about enjoying the moment. Believe it or not, I did not want the Boston Marathon and this experience to go by too fast. 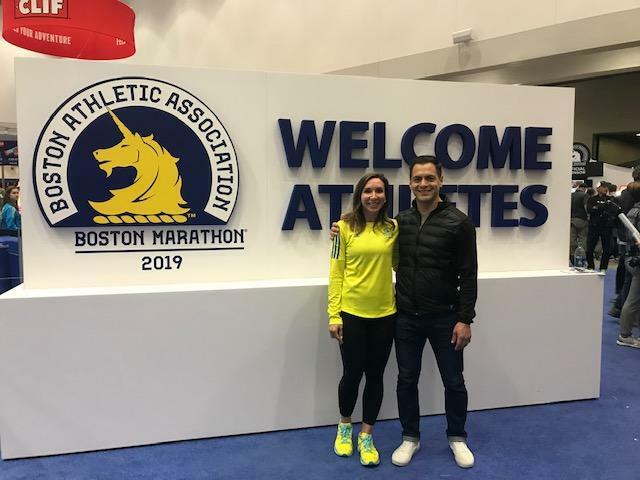 I spend so many races leading up to Boston, so focused on my time, my pace and meeting that guaranteed BQ time, that I did not want to miss a moment of the Boston energy I had heard so much about. Friday evening I enjoyed a glass of wine at dinner (also water) with my parents, who traveled to Boston from Houston, TX just to support me. Saturday I enjoyed time with friends from Houston hanging out by the pool, I ran to see the Boston 5K and explore Boston Commons and the Finish line during the day. Then Sunday I did a shake out run with Team Sugar Runs runners and spent time with Jessica and Katherine. As we were running around Boston Commons I felt so grateful just to be there. It actually felt pretty warm and humid. I remember being surprised how warm it was at about 8:30 am. It actually felt similar to running in Houston, TX. Other runners shared their past experiences and advice for getting to the starting line and making sure to “go straight to the porta-potties when you get off the bus!” I ended up going to the race expo Sunday afternoon before the race rather than right away Saturday morning. I enjoyed a beer with my husband at the expo and took so many pictures. It was probably a good thing most Boston Marathon clothing items in my size were sold out. I took in every moment leading up to the race. Team Sugar Runs meet up and shake out run. With Robert at the Expo 3 hours before it closed before race day. Monday morning before the race I woke up without an alarm. I couldn’t sleep! I was so excited! I got up got dressed went downstairs and was excited to see the hotel was providing free coffee and bananas to runners very early. I was not the only one up so early. I had coffee and a Honey Stinger waffle and then a little later a bagel with Justin vanilla almond butter. I took water, Gatorade, a banana and honey with me on the bus to the start. I packed some Glukos tabs, 4 Huma gels (strawberry lemonade) and…. tampons (extra just in case). It was raining as we left the hotel to board the buses. I wore long sleeves, a thin wind breaker jacket from the 2015 Santa Rosa Marathon, a big poncho and pants over my shorts. All items I was fine parting with. I also wore old socks and old Newton running shoes that I was okay donating. I wrapped my newer Newton running shoes in a plastic bag with clean dry socks. Right before getting on the bus. It was cold, windy and raining. Our bus ride to Hopkinton took 1 hour. We arrived at about 9:55 am and our wave was supposed to start at 10:50 am. I HAD to use the porta potty. To pee but also I was on my period….so I had to before I started the race. Right when we arrived at the Runners Village, we went straight to the porta potty line. We waited for about 1 hour. All of the sudden it warmed up! The sun came out and we stripped off all our layers and donated our clothes and I donated my shoes. Taking off our layers and running to our wave that had already started. We had to run to the start to get to go with the blue wave. We ran so fast, I thought we actually started the race. People were cheering us and giving us high fives! Ha! looking back I laugh. It was so fun! My friend Amy told me to calm down because we hadn’t even started the race yet. Finally we started at the end of the blue wave. Amy was supposed to be in corral 1 and I was supposed to be in corral 3. At that point I was not worried about it. I was there to run Boston and I was determined not to let anything bring me down. Not my period, not our late start and not the crazy changing weather. As we started running I was so excited. I know I had the hugest smile on my face. I even remember a spectator yelling, “You are running the freaking Boston Marathon!” Each mile went so fast! I remember thinking, I don’t want this to go buy too fast. There were so many people giving high fives. I feel as though I must have given 100 high fives. I was happy to see my friend Holley and she was looking great! This was also Holley’s first Boston Marathon and her and I did our first IRONMAN together in Tempe, Arizonan 9 years ago. She looked great and told me to go ahead and she would see me later. She was going to take pictures! :) I love Holley! At mile 6 I took a gel. All of the sudden it was mile 9 and I thought I should just go to a porta potty and change my tampon just in case…. mile 10 the sun came out pretty bright. It warmed up quick. I remember approaching Wellesley near mile 13 and the crowd was soooo loud!!!!! I saw a very strong runner I had run with in Los Angeles and she didn’t look like she was doing well. She had been sick the week before. It was warm for us and she was having trouble breathing. We ran together for a little bit and I just remember saying to her to take it at her own pace, we will finish this. We ran together. Then all of the sudden she told me to keep going. She had to stop for a little bit. I didn’t want to her to stop I wanted her to keep going. I knew she would finish but she needed to take her own time. Each of us have our own goal, mindset and race we want. The rest of the race I was thinking I hope she’s oaky. Long ago a man told me I wouldn’t qualify for the Boston Marathon in Chicago and Los Angeles because those marathons are just too big! A high performing athlete once told me my body is made for shorter distance running and I probably shouldn’t run long distance or marathons. In my mind I’ve always said to myself “Don’t believe me just watch!” I did it! By mile 18 I took another gel, water and ice from those offering. I poured so many cups of water on me and it felt so good! I ran through any sprinklers or water that was being sprayed on runners. I took a popsicle from a spectator that was cheering and offering them and I went to a porta potty just to change my tampon (probably not necessary but just in case I wanted to be safe). I had no GI issues just wanted to stop to make sure I was all good. At that point I do not think I even look at my watch or my pace at all. I had never run a marathon and not payed attention to my pace. I LOVED IT! I was looking at the crowd, enjoying the music, giving high fives and getting emotional. Then all of the sudden at mile 22 I hear my husband shout my name! I was all the way across on the other side of the street! I yelled to other runners, I’m goin that way——-> pointing across the street so I wouldn’t trip them up. I was sooooo excited!! My dad and husband were there to cheer me on. I teared up and had the hugest smile on my face. Most races I don’t stop, I just wave and say, “ I love you! “ “See you at the finish!” This time I stopped and hugged and kissed and wanted my husband to know how much that meant to me. He’s the best! And my dad being there meant the world! One year ago my dad was recovering from radiation therapy on his throat and had the hardest time eating, drinking, talking and brushing his teeth. Now at age 69 he was there cheering me on at the Boston Marathon. It was a very emotional moment for me (I’m crying writing this). I told them “I’m going to go finish!” (Because I was so happy I was ready to start celebrating but I still had 4 more miles to go)! Seeing Robert and my Dad at mile 22! I was having the best time! So much fun. At mile 25 a very tall man volunteering or with the race told me, “from this point right here, you have exactly 1 mile left!” I shouted, “whooooooo!” and all o the sudden both of my calves tightened up! It seemed like I tensed up or got too excited! Ha! I took deep breaths and the cramps went away. Then all of the sudden I see my close friend Agustina (who I had ran my first marathon with in Chicago 2006). She was not feeling well. She was used to running in cool weather in the Netherlands. We stayed together that entire last mile. That last mile was amazing. The crowds were sooooooo loud! I got chills. Agustina and I kept checking in with each other. I remember I kept saying to her, “This is amazing!! !” Crossing the finish line with her was so emotional! I’m pretty sure I ugly cried and we hugged after we crossed the finish. Crossing the finish line with Agustina! Then all of the sudden out of no where, the temperature dropped, it started raining and the wind picked up! We got our gear check backs and changed and waited to meet our friends and family. It was a beautiful experience. For me, it was proof I could do it. I could qualify and run Boston and enjoy a race and be in the moment. Later I was so happy to hear that Alma, the runner I saw at mile 13 had finished and Team Sugar Runs athletes finished and did well. My coach was so helpful through all of this and I believe I am a stronger runner after following his training plan. I was just not in the mood or wanting to “race” Boston. I wanted to be in the moment, take it in and not look at my watch. I wanted to look at Boston and the people. For right now I’m still going to run, because I love running, but I am going to focus on helping the athletes I’m working with meet their goals. I also have other goals I have for myself in the near future I would like to focus on. Running Boston was one of the best experiences in my life. I am just so grateful I was able to spend it surrounded by many people so important to me. My husband and daughter, my parents, my friends, my teammates and other runners I have met running around Los Angeles. It was amazing. Boston was challenging but it was so good to us. This experience is a gift and a privilege and I am so grateful. A wonderful way to welcome almost 38! I’m also so thankful to those that have run Boston several times before and offered advice and encouragement (Jessica Reyes, Amy Craft, Agustina Rayner, Kristin Kabay, Lauren Ross, Starla Garcia, Pam Nisevich Bede, Debra). Thank you all so much! Your advice was very helpful! For about 2 days after Boston my calves were sore but now feeling great! Looking forward to more runs and hikes where I’m not too focused on my watch or pace. Thank you for reading if you’ve gotten this far. This will be my first time running the Boston Marathon. As you can imagine, I am very excited and at the same time I can’t believe that it is so close! Since this is my first time to run Boston, and to ever start running a marathon after 8 am, (I will be starting about 10:50 AM Boston time) I thought it would be a good idea to reach out to Registered Dietitians that have run the Boston Marathon before and ask them for any nutrition tips and advice they would like to share. I love the running and dietitian community! Each dietitian I reached out to was happy to share their experience and advice with me. Hopefully if you are a first time Boston Marathon runner as well, you will find these tips helpful. Think about possibly having 2 breakfasts or 1 breakfast and a snack before you start. Carry familiar snacks and food/fluid on the bus or with you while you wait to start. Stick to foods and fluids you have used during your training. Nothing new race day! Carry extra gels or sports nutrition you plan to use "just in case." Choose foods that are easy to digest and that you are familiar with to snack on while waiting to start or taking a shuttle. Give yourself time to fuel and use the restroom and if needed do relaxation exercises to calm your nerves/nervous stomach and fuel and hydrate well. Do not try anything new or have a "heavier" than normal breakfast or dinner the night before (avoid fried foods if you are not used to them). Bring clothes to donate. It can be wet or cold while you wait to start. Bring something to sit on or a plastic bag. Pam and I went to Miami University together (in Oxford, OH) and studied nutrition there for our undergraduate degree. I was able to connect with Pam again with the help of social media and reached out to her for any tips on running my first Boston Marathon. With the late start, I'd aim for two breakfasts- a small one prior to loading up on the bus and then another small breakfast to snack on in the Athlete's Village. They will have bagels and coffee there and I also bring a bit of peanut butter and a banana to add. There are the same food I'd eat before a training run so I know they'll work well with my system. I've run the race in record low temps as well as high temps. Bring fuel and apparel options to be ready for whatever the day holds. Nothing like having to run out the day before to get gear when you know you have so many tried and true options back home. Don’t be nervous and have fun! The crowd support is INCREDIBLE! You will be supported the entire 26.2 miles and when you come into downtown (Right on Hereford, Left on Boylston) you will be emotional and the tears will flow! It’s something that is so incredible and I still get teary thinking about that exact moment. To race or not to race? Someone once told me that no one races BOS. But then a really good and fast (2:40 marathoner) friend told me to race and go for it and not to let the course scare me. I have consistently improved my time each year I’ve run. This is a personal choice, but if you’re afraid you won’t do well, that’s absolutely not true! I always have plan A marathon time, plan B marathon time, and so on in case I don’t have a great day I still have a plan and something to shoot for. Runner Village. When you get to the runner village, you will be waiting for a while. Bring comfy throw away clothes, a snack/fluids, but they also have bagels, coffee, gels on site too. Just know that whatever you bring you will have to leave or run with during the race. I also bring a plastic bag to sit on. It’s a big field with tents, so having something to sit on is nice. Crowd support. Write your name on your arm or use a sticker or temp. tattoo and the crowd will call your name and cheer you on. I loved hearing random people cheering for me by name as I ran by. Heart Break. It’s not that bad. Just slow down and keep going. The first time I ran it I didn’t even realize I had crossed it until I saw signs that said I had made it. LOL The locals also have ice, fruit, candy, and other goodies for you as your running. Last year I made sure to sleep the week of since even though it's a later time in Texas, I wanted to make sure my body rested especially with the travel. I also made sure to eat breakfast and hydrate. I took my bagel and peanut butter with me on the bus and drank fluids prior to start time. I also carried an extra granola bar before just in case I got hungry again. Since I ran Boston in record cold temperatures I carried extra gels. Just so my body had enough energy. I normally take a gel every 5 miles and take fluids on the course (both Gatorade and water). The last few years have been so unpredictable so really knowing what kind of fluid you work well with is crucial. If it's hot -carry extra salt tabs (if you have trained with them before) and/or take fluids sooner versus later. Same goes for cold-you don't want to get dehydrated later on in the race. Knowing which fluid they have on the course is helpful! If your tummy doesn't agree with the fluid they will have -carry your own! Most importantly have fun! It's a great experience! If you can stay in and around Hopkinton the night before, DO IT. I was able to sleep until 7, eat a solid pancake breakfast and relax before taking a short 5-10 minute shuttle ride right to the corrals. If not, BRING SNACKS!! The trip from Boston to Hopkinton and the waiting around takes a long time and you need to be fueling during this time. Bags of dry cereal, sports drink, bagels, honey stinger waffles...choose foods to snack on that are easy to digest and that you've used before. Don't be skimpy! You have hours before the start and an empty stomach going into a race can spell disaster! Huge thanks to Pam, Kristin, Starla and Lauren for their tips and sharing their experience with me and all the first time Boston Marathon Runners! Happy Race Week! Many of you may know what this is but for those that don't...this is a Bod Pod. It measures body composition (% body fat & % lean mass) using air displacement plethysmography/ADP. This method is validated and similar to underwater weighing. However, no submerging underwater is necessary. The Bod Pod test takes approximately 10-15 minutes total. You have to take the test fasting, wear compression shorts/tights and top or a tight fitting swimsuit and a swim cap. The Bod Pod is a simple body composition test that can help athletes understand their body composition, help prevent muscle loss in injured athletes and estimate energy needs when working with a registered dietitian. I know several athletes are aiming to lose a specific amount of weight/fat mass. This number has been a weight they've chosen as a personal weight goal, a coaches recommendation or they read somewhere that for their height and/or sport, they should be at a certain weight on the scale. In reality, some may not even have enough fat to lose to meet their goal (it would put them at an extremely low and unhealthy body fat). We (and our bodies) are all so different. Even if you have a group of people the same gender, age and height playing the same sport or event, each athletes' ideal weight range for health and performance will be different. It is true that for some sports/events having more muscle mass or being lighter (while still fueling your body enough) can improve performance. However, in many cases being too light or not fueling enough, may decrease performance and lead to other health consequences. The weight on a regular scale will give you a number of your total weight (lean mass/muscle/water/bone/fat mass) all together. This number can easily fluctuate based on fluid intake and volume of food intake over a short period of time. For example, if you were to weigh an empty bucket and add 4 cups (24 fl oz)to it, the bucket will weigh 2 lbs more. The same happens when we eat, drink, run and sweat throughout the day. The scale is going to go up and down. It can be helpful when measuring sweat loss after a training session but for athletes aiming to gain lean mass or lose fat mass, it is not the best tool to use. Also some scales claiming to read body fat percentage can also easily fluctuate depending on hydration status. Note that the Bod Pod is not recommended for everyone (struggling with eating disorders, body dysmorphic disorder or severely claustrophobic). There are other useful methods of measuring body composition as well. It is helpful to use the same tool or form of measurement when looking at body composition and not focusing too much on the specific number, but the trend and progress overtime (depending on what your goal is). Tips on fueling before long distance races. Tips for fueling post events, games, training and races.